"Shh, we are watched. I shall kill you some other time." When Charlie Chaplin signed a one year, $670,000 contract with the Mutual Film Corporation in 1916 to produce twelve short films, he became the highest-paid entertainer in the world at that time—not bad for someone only two years into his motion picture career. Having spent several years as a comic in the Karno traveling shows, he was signed by Keystone in 1914 to be a comedian there, in their knockabout farces. Churning out a picture every week or two, with standard themes and with rudimentary stories, didn't sit well with Chaplin, however, who wanted to do something more. He took the chance to move to Essanay in 1915, where he began to stretch the comedy genre and to further refine his classic Little Tramp character. But it was in the Mutuals where the Chaplin that made history was really fully formed; it's in these films that the Tramp comes into his own, and pathos begins to be mixed in generously with the comedy. Giving Chaplin additional time to refine his work didn't hurt either (the contract ended up taking 18 months to complete as a result of his perfectionism), and the results are twelve comedy classics that stand the test of time. This set of four discs collects all twelve, presenting them in chronological order so that Chaplin's development can be traced picture by picture. In The Floorwalker and The Fireman, there's still quite a bit of the old traditional slapstick on view. Mountainous Eric Campbell stars in the former as an embezzling store manager who is foiled by Chaplin, who accidentally becomes the new store floorwalker. One of the highlights is the set of endless variations of Chaplin (and Campbell) being trapped going the wrong way on the escalator. Another is a ludicrous dance sequence that highlights Chaplin's skill on his feet. The Fireman includes a cynical plot by Campbell, who plays a crooked fire chief willing to let a rich man's home burn so he can collect the insurance. But when his daughter, frequent leading lady Edna Purviance, is trapped within, it's up to Charlie as the hapless fireman to try to rescue her, leading to a wild climbing sequence. The future of Chaplin's direction is more vividly seen in The Vagabond, as the tramp first gets in trouble as a saloon violinist, then tries to help Edna, a gypsy, while trying to stay out of the way of Campbell as the gypsy chief. It's more dramatic and allows Chaplin a bit of room to expand the comic world that he's creating, playing the two sentiments off each other. But Chaplin falls right back into old habits with One A.M., which features his reliable old wealthy drunk character (a far cry from the Tramp) from the Karno stage show. But it's a virtuoso turn nonetheless, as it's practically a single-character film, with Chaplin getting into endless inebriated trouble with the accoutrements of his home. The Count finds Chaplin working as an assistant to tailor Campbell. Fired for his incompetence, he winds up at a party being given by Miss Moneybags (Edna) for the newly-arrived Count Broko. Naturally, Chaplin pretends to be the Count, to humorous effect. In The Pawnshop, Chaplin uses the setting and the props to create much of the comedy, with some particularly notable ladder gags. Behind the Screen is one of the most consistently funny of the Chaplin Mutuals, as he plays David, the hapless assistant stagehand to Campbell's Goliath. The motion picture setting is worked for everything it's worth, culminating in a parody of the Keystone studios and their notorious pie fights. The Rink feels like two one-reel shorts pasted together, but they're excellent one-reel comedies. 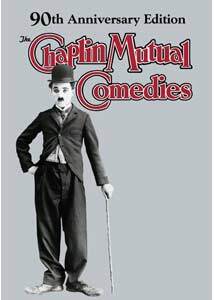 The first half features Chaplin's misadventures as a waiter, with Campbell as Mr. Stout, one of his primary victims (and stout Henry Bergman cross-dressing as his wife). Then the action moves to the titular rink, where Mr. Stout flirts with Edna but is foiled by an off-work Chaplin. The timing in both halves is exquisite, and Chaplin's gracefulness, stemming from his dance background, is on display in both segments. Particularly amazing is the pas de deux on roller skates with the massive Campbell. The impudence of the Tramp character comes across in full force here, as he refuses to put up with the airs of the wealthy. On the opposite end of the social spectrum is Easy Street, one of the most thematically complicated and satisfying Chaplin films up to that time. Edna stars as a mission worker who convinces the Tramp to get work; unfortunately for him, that work turns out to be as the policeman assigned to Easy Street, a den of iniquity ruled by bully Eric Campbell. It's full of pathos, most notably in the starving family with dozens of small children (taken aback, Charlie gives the father of the family his star). It's also remembered for the somewhat shocking scene in which an anarchist kidnaps Edna, putting her in the clutches of a dope fiend. It's a gem of a film that everyone should see. Alcoholism is the theme of The Cure, with Chaplin ditching the Tramp to play a wealthy drunk again; it may be that it was easier to make him a humorous figure this way (the Tramp certainly couldn't afford a "rest cure" in any event), and it sets up Eric Campbell as a testy gout patient (of course, that means his foot will inevitably get clobbered). There's an entertaining revolving door gag and quite a few bits with Chaplin's smuggled booze. The Immigrant is one of Chaplin's most beloved films, and a timely one in this period of anti-immigrant hysteria. Chaplin and Edna are immigrants crossing the Atlantic via boat, under miserable circumstances made none the better by their reception in the States. The second half is devoted to diner gags as Charlie realizes he has lost his money and tries to evade waiter Eric Campbell. Edna is at her sweetest, and there's plenty of pathos and emotion to spare. The final Mutual film is The Adventurer, which has a fairly flimsy plot, featuring Chaplin as an escaped convict who gets taken in by Edna's family after he rescues her mother. When Campbell sees his picture in the newspaper, the chase resumes in earnest. These pictures still hold up well and contain plenty of laughs. Although previously released as three single layer DVDs by disc producer David Shepard, several of the films contain additional, newly-discovered footage. Among these are One A.M., Behind the Screen, and The Rink. The most substantial additions come in One A.M., which adds over five minutes of running time. Image Transfer Review: The full frame picture looks pretty good on the whole; disc producer David Shepard advises that these are the same transfers as on the old discs, with added footage and some substantial additional digital cleanup. There seems to be quite a bit less speckling and scratching than on the old versions. Since some of the original nitrate materials have decomposed since those transfers were done in 1994, this may be about as good as these pictures will ever look. Depending on the source material, they vary from excellent, with plenty of detail and texture, to slightly dupey and somewhat soft. The use of dual layer discs allows for a somewhat higher bit rate. The transfers are thoughtfully windowboxed, since the action tends to go to the very edge of the screen. Audio Transfer Review: One of the biggest improvements over the prior release is that the nasty synth scores have been replaced by full orchestral scores by the esteemed Carl Davis. The effect is huge, giving these films a sense of importance that they deserve, and dropping the cheesiness that often made them seem tawdry. The audio quality is excellent throughout, with no noise or hiss. There are occasional sound effects, but they're restrained (and thankfully, slide whistles are totally absent). Extras Review: The Mutual films take up the first two of four discs, along with a gallery of exceedingly rare stills (which is oddly enough repeated on both discs). The remaining discs are devoted to two substantial documentaries. The Gentleman Tramp is a 1975 biography of Chaplin, narrated by Walter Matthau, comprised almost entirely of clips from Chaplin's pictures. At 78 minutes it can hardly provide anything more than a once-over, but it gives the novice a decent introduction to the actor and director. It is brought down a bit by some fakey voiceovers by third parties intended to be the harping voices swirling around Chaplin; they're somewhat tasteless and obnoxious, though in some senses that's quite appropriate. More solid is the look at Eric Campbell, Chaplin's Goliath, by documentarian Kevin McDonald, originally produced for Scottish television. It's hampered a bit by the lack of firm knowledge about Campbell's beginnings, but it's certainly intriguing to see Campbell without his usual grotesque makeup, and one gets a good sense of the music hall life. One of the best aspects of this production is the inclusion of substantial outtakes from the Mutuals, including a version of the diner sequence in The Immigrant with short and rotund Henry Bergman playing Campbell's role to much less threatening effect. Ray Bradbury might be surprised, however, to learn that he has been buried at Rosedale Cemetery along with Campbell for some years. The package also includes two substantial booklets. The first is an excerpt from Jeffrey Vance's coffee table book about Chaplin, with plenty of background information. A somewhat slighter booklet covers the making of The Gentleman Tramp, and frankly offers a good deal more solid information than the movie itself. Both are definitely well worth reading through. A dozen classic treasures of silent comedy, with much improved scores and some added footage, plus some useful documentaries. Highly recommended indeed.